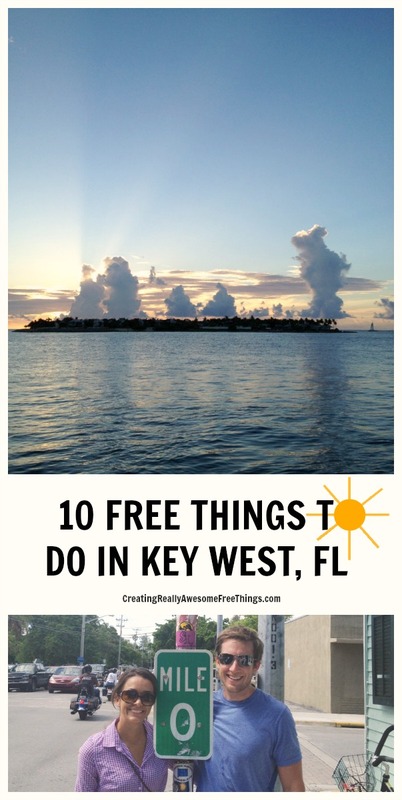 Creating Really Awesome Free Trips: Key West, FL - C.R.A.F.T. Note: Did you know that we’ve got 50+ city guides with 10 fun, free family friendly things to do in cities all over the world! Check out the complete list of Creating Really Awesome Free Trips! Every night there is a sunset celebration in Key West. (Celebrating the sun setting every night? So cool!) 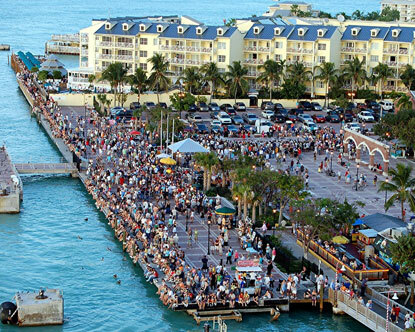 Mallory Square has no admission fee, and is the best place to go at sun down. Located right on the water, there are tons of street performers and vendors. The street performers do everything from jaw dropping acrobatics, to walking on glass and eating fire, to locking themselves up in chains. (Pretty interesting seeing that guy get out of the locks!!) The vendors sell food, jewelry, art, and handmade crafts. When the sun goes down, everyone stops to watch, and then they all cheer! Not only is Mallory Square a great place to people watch, plenty of boats sail by at the same time, too. This is the place to be! Fort Zachary Taylor is my family’s favorite place in Key West, hands down. We spent so many wonderful days chillin’ on this beach, snorkeling around the rocks, and exploring the historic fort. So I’m gonna be straight up honest with you here. There are a few free beaches in Key West, but, as a local, I refused to swim in them. Trust me on this one…EWW. As a friend, I strongly suggest that you spend the couple of dollars it takes to get into Fort Zachary Taylor. BY FAR it has the most beautiful, well maintained beach. With your entrance fee to the beach, you can also tour the fort for free. So this place is really cool and fun for kids. Located right by Fort Zachary Taylor, the Eco Discovery Center is both kid and parent friendly. Admission is free. There are lots of fun exhibits, like the Mote Marine Laboratory Living Reef exhibit, which includes “a 2,500-gallon reef tank with living corals and tropical fish, a live Reef Cam, and other displays that highlight the coral reef environment.” Make sure to visit the theater and watch “Reflections of the Florida Keys,” a short movie about the Florida Keys’ ecosystem. Pickle really enjoyed the movie…there were lots of fish and sea creatures to look at! Duval Street is, by far, the craziest, most fun place in Key West. Similar to New Orlean’s Bourbon Street, it’s (mostly) family friendly in the daytime, and at night the adults have lots of fun. Tourists enjoy shopping, eating, and walking around. I especially love (free!) people watching and store front browsing on Duval Street. You will see just about anything and everything there. Some of the stores will pass out free items, too, to get you to come inside and look around. A few times a year, Duval Street closes to cars to host street festivals, races, and activities. If you’d like to see what’s happening there now, check out the live Duval Street cams. Our favorite place to get key lime pie is at Kermit’s. There are other key lime pie places in town, but Kermit’s is a local business, and there is only one location. 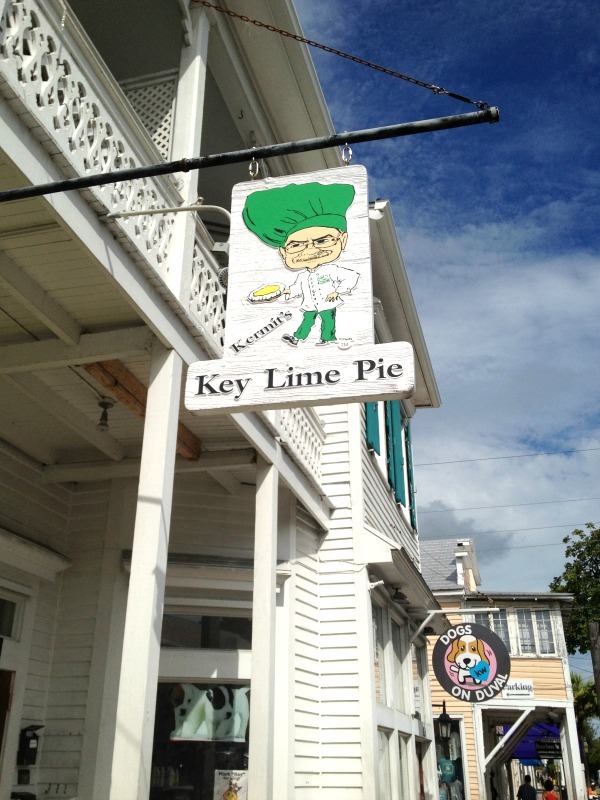 And they don’t just sell key lime pie…they sell key lime everything. We love trying out their free samples of salsa, barbecue sauce, cookies, crackers, jelly…you name it. They have yummy lemonade and (my absolute favorite!) key lime pie on a stick. It’s dipped in chocolate, and OH.MY.FREAKING.GOSH so yummy. This is the place to get your key lime fix. Kermit’s also ships if you can’t wait for a trip to the Keys to get some yummy pie. 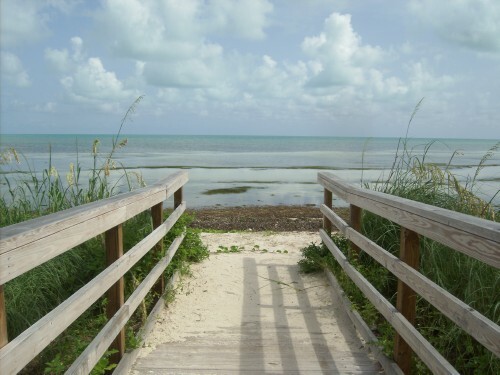 Located in between condos and apartments is the Key West Nature Preserve. There are two entrances on Atlantic Blvd: one is a walking path, and the other leads to a boardwalk overlooking the ocean. It is not obvious, so keep on the lookout for the entrances…they’re easy to miss. The City of Key West acquired the ocean-front property and turned it into an accessible natural area. Now operated by the Key West Garden Club, wooden walkways and trails take you through mangrove forests to a quiet strip of beach. Kids love seeing crabs, birds, butterflies, and lizards. Admission is free. President Harry S. Truman spent lots of his time in Key West, and this “Little White House” was his winter home. You can take a guided tour of the house and grounds for an admission fee. But, if you have small children, or just aren’t sure you want to pay to look around, you can tour the pretty grounds and gift shop for free. My history buff husband totally recommends checking out the Truman White House. Here’s another fun photo op! 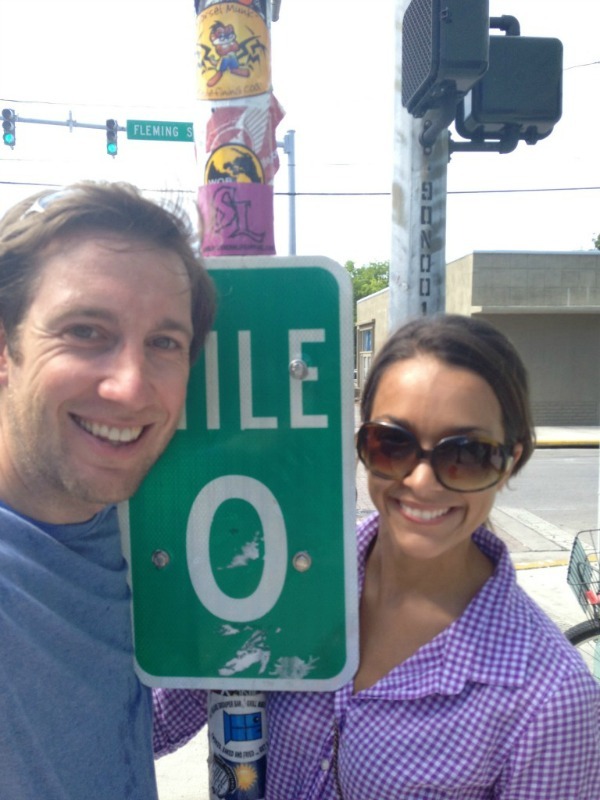 Mile Marker 0 is the end of the line for US 1. Why is that so interesting? Because the road starts in Fort Kent, Maine and travels 2300+ miles all the way down the east coast (through 14 states) to this little spot. It’s the farthest south you can get in the 48 continental states and still be considered in the US. While I lived in Key West we were able to meet a few people who actually took the entire trip from Maine to Key West and had mile marker travel pics to prove it. So grab your camera and take a shot of how far south you really are! The picture makes the perfect quirky and free souvenir! So we used to live on Roosevelt Blvd. in Key West, and there is this awesome boardwalk that goes the whole length of the street. It’s a good 4 or 5 miles long, and on one side is street while the other side is ocean. Lots of people run, jog, roller blade, and walk around the boardwalk. Some fish off the side. My favorite thing to do was walk along looking at sea life. I’ve seen crabs, nurse sharks, and tons of fish inside the water and rocks. The airport is located on Roosevelt, so you can watch the planes come in, too. The perfect time to be on Roosevelt is early in the morning and at dusk. This (free) boardwalk helps you get some exercise in on your trip, lets the kidlets see some cool sea life, and you can catch a beautiful view while you’re at it. 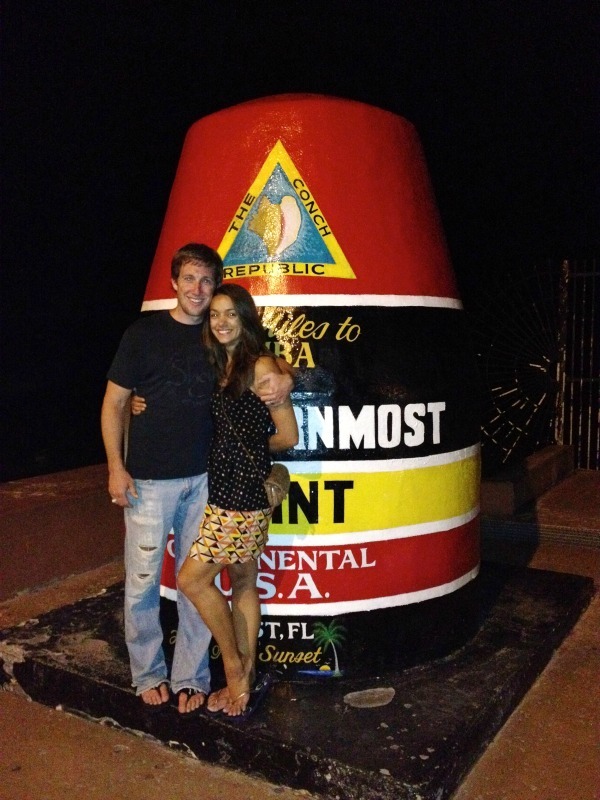 For more information about where to sleep and eat in Key West, check out my weekend trip! Thanks so much for letting me take over your blog today Jamie! Hope you get to take a trip to The Keys soon…you’ll love it!! Thank you so much for being awesome and writing up the post! I can. not. wait. to get to The Keys! Dude! I have never been- but this has been on our list of places to go and now I want to even more! It looks like a totally rad vacation! Thanks for the tips, chica! It is quite beautiful and peaceful. I love reading through your blog, I wanted to leave a little comment to support you and wish you a good continuation. Wishing you the best of luck for all your blogging efforts. Thanks for the great tips – We are headed there in May so I will definitely be using this list soon! Key West was SO much fun 🙂 Enjoy! Actually, there are 2 Kermit’s locations in Key West… our flagship location that’s pictured here at 200 Elizabeth Street, and a second location at 802 Duval Street, in the heart of it all! Thanks for sharing! Love me some Kermit’s! Where do you stay in key west? Awesome list! Thanks! Headed there this weekend to celebrate the 4th! We’ve been to Key West a few times but as young, drinking, party people. Now I’m bringing my daughter and 6 friends for her Sweet 16, the last Sat of January. I want to take them to a fun, party atmosphere for dinner. I want it to be fun but not rowdy (like my old days). I figured we would walk and shop around Ducal and Mallory Square but where should we go for a fun dinner with non alcoholic fun drinks?